Her boxwood flute is made by Philippe Allain-Dupré, Paris, in 2009 (A 415) based on Denner (outside) and Stanesby (inside) and a grenadilla copy of the Hotteterre ‘Berlin’ flute (A 392) made by Giovanni Tardino, Basel in 2013. David Parsons studied at the Royal College of Music as a pupil of Diana Poulton. Following a successful Wigmore Hall debut he has toured widely in Europe, Scandanavia and the USA. He has broadcast in London, Los Angeles, Oslo, and Munich and presented a recital of Lute music for Spanish Television. 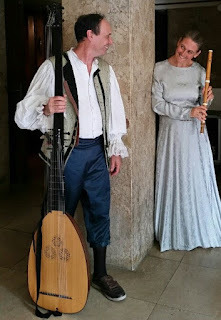 His recent CD releases have included Elizabethan Lute Music, 18th century ‘galant’ chamber music with his trio, The Haydn Lute Trio and the music of the 19th guitar virtuoso Fernando Sor together with the soprano Evelyn Tubb.